Is There a Vast Buried Ocean on Saturn’s Enceladus? NASA and ESA researchers have been debating whether Saturn's tiny moon, Enceladus, harbors a vast underground ocean. New evidence suggests that Enceladus has an ocean that is probably seltzer-like and could be friendly to microbial life. In 2005 NASA's Cassini probe flew past Enceladus for a close encounter and found that the moon was ejecting plumes of water vapor, icy particles, and organic compounds out through fissures -named Tiger Stripes- in its frozen surface. Mimas, a nearby moon about the same size, was as dead as researchers expected, but Enceladus was exepectedly active. "Geophysicists expected this little world to be a lump of ice, cold, dead, and uninteresting," says Dennis Matson of NASA's Jet Propulsion Laboratory. "Boy, were we surprised!" Many Cassini researchers viewed the icy jets as proof of a large subterranean body of water. Near-surface pockets of liquid water with temperatures near 32o F could explain the watery plumes. But there were problems with this theory. In initial flybys, Cassini's instruments detected carbon, hydrogen, oxygen, nitrogen, and various hydrocarbons in the plume gasses. But there were none of the elements of salt that ocean water should be there. "It wasn't in the plume gasses where we'd been looking for it," says Matson based on results in 2009 from Cassini's cosmic dust analyzer. "Instead, sodium and potassium salts and carbonates were locked up in the plumes' icy particles. * And the source of these substances has to be an ocean. Stuff dissolved in an ocean is similar to the contents of these grains." The latest Cassini observations revealed another amazing discovery: thermal measurements revealed fissures with temperatures as high as -120o Fahrenheit (190 Kelvin). "This discovery resets our clocks!" says Matson. "Temperatures this high have to be volcanic in origin. Heat must be flowing from the interior, enough to melt some of the underground ice, creating an underground waterworks." The finding has led the scientists to ponder how contents of an ocean capped by a crust of ice as much as tens of miles thick could reach the surface. "Have you ever been sprayed when you popped the top of a soda can?" asks Matson. "Most of the water spreads out sideways and 'warms' a thin surface ice lid, which is about 300 feet thick," explains Matson. "But some of it collects in subsurface chambers, builds up pressure, and then blasts out through small holes in the ground, like soda spewing out of that can you opened. As the remaining water cools, it percolates back down to replenish the ocean and start the process all over again." "Where's the heat coming from on this tiny body?" wonders Larry Esposito of the University of Colorado. "We think tidal heating could be contributing." Saturn's powerful tides actually cause the shape of Enceladus to change slightly as it orbits. Flexing motions in the moon's interior generate heat–like the heat you feel in a paperclip when you rapidly bend it back and forth. In this model, internal friction powers volcanic activity, which warms and melts the ice. 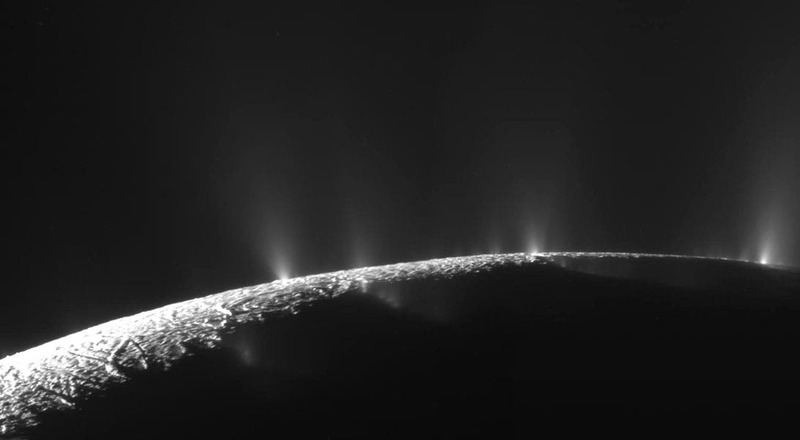 "It's clear now that, whatever is producing the heat, Enceladus meets many requirements for life," says Esposito. "We know it has a liquid ocean, organics, and an energy source. And to top it off, we know of organisms on Earth in similar environments."